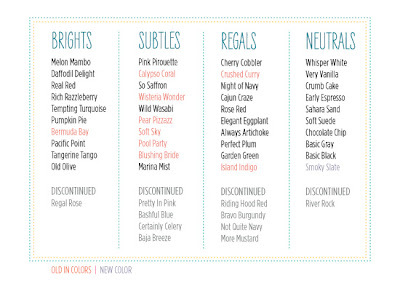 The Serene Stamper: Colour Changes and Free Shipping from Stampin' Up! Colour Changes and Free Shipping from Stampin' Up! Stampin' Up! has some exciting changes coming our way with the 2013-2014 Catalogue (available June 1st) and one of those changes is a 'Colour Refresh'. I'm excited about this (don't worry, it's nothing too drastic) and I think you will be excited too! But some of your favourite colours will be going and they will only be available while supplies last. I have a feeling some colours (card stock, ink, ribbon, etc) are going to sell out almost immediately so if there are items you want to stock up on before they're gone, you may want to snap them up quickly. You can get them by clicking HERE. will be available only while supplies last. This means that some products will not be available through the retired list period. We did anticipate increased demand and based our forecasts for these retiring colours on historical sales information from previous colour transitions. However, even with the most careful planning, the response to a transition of this nature can surprise everyone--including you in your own business and personal purchases. favourites before they are GONE! To shop online 24/7 just click HERE.